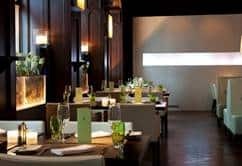 From November 22 – December 1, 2018, Rive Gauche at Zurich’s famed Baur au Lac hotel will be transformed into “Matsuhisa at Rive Gauche”, featuring the pioneering Japanese-Peruvian cuisine of celebrated chef Nobuyuki “Nobu” Matsuhisa. For the eleventh consecutive year, a team of chefs from Nobu’s world-renowned kitchen will visit the Rive Gauche restaurant and replace its Mediterranean cuisine with Nobu specialties like Black Cod Miso, Yellowtail Sashimi with Jalapenos and Lobster with Wasabi Pepper Sauce. Two seatings are available per evening (6pm and 9pm) for dinner at Matsuhisa at Rive Gauche.